By LUDWIG VON KOOPA - It's exactly what Nintendo wants. As you should have read in the tail-end of our first part Live Reactions to Nintendo Treehouse on September 12, and throughout the entire second part of those reactions, both RawkHawk2010 and I have Super Smash Bros. For 3DS demo. It's a treasured possession, to be sure. People like treasure. So much so, that hundreds of people are auctioning off the demo codes. For like $10-20. Keep in mind the demo will be available for free and for everyone this Friday, September 19. Bit of background if you don't know: During the Treehouse stream (prior to KoopaTV beginning its live-reactions — it was an eight-hour event, and we only live-reacted to four hours of it) they announced that demos would be available September 19, or approximately two weeks before the game's launch. This is in contrast to the Japanese getting the demo two days before the Japanese launch. BUT! For select Platinum-grade Club Nintendo members, they could get FOUR demo codes to be redeemed in the Nintendo eShop September 12 (that day)! So one code for you, and three others for your friends. The demo allows you to play local multiplayer with your pals if they also have the demo. (This is something I managed to do on Saturday. Fun.) For whatever reason, a lot of Platinum Club Nintendo members apparently don't have three other friends. 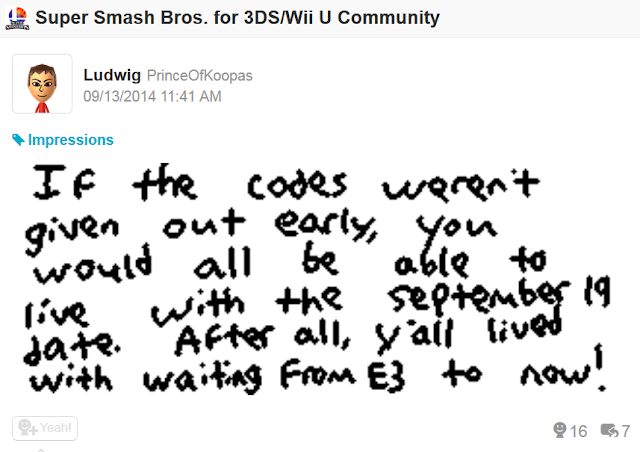 I also heard that some people who don't even have 3DSs got codes e-mailed to them. So they had to get rid of these codes somehow! As with any unregulated free market industry, there are basic supply-demand principles at play. Don't worry, I'll explain this. In this case, there is a finite supply (there aren't unlimited of them), though we have no idea how finite it is. Once all of the codes have been exhausted, there will no longer be any more. Or when September 19 hits. Whichever comes first. Once it's September 19, the value of the codes goes down to zero. The supply curve really does not look like what it is on the left. It's much more inelastic, hence the change in the right graph. Every actor in the market knows that the supply is limited. Normally, limited supply by itself does not make the demand curve shift outward (more demand). However, marketing stunts can do that, and the limited supply here IS a marketing stunt. It's what Apple does. And Nintendo did it with the Wii when it first came out, however much they want to claim it was just manufacturing shortages. As a result, there is a low quantity of codes and they go for a high price. As in, they go for a price. A price that goes anywhere from 1/4 to 1/2 of the actual game's price when it goes on sale in less than 3 weeks. The demo has a smidgen of the content of the final game. Like, 1% or so. Or less. 5 characters (Evil plumber, Link, Pikachu, Villager, and Mega Man). 1 stage (Battlefield, in two formes). The starting set of items. Two minute time match only. You can't even have team battles. The same people buying these codes and thinking they're a good value are the same people who buy and think the Mario Kart 8 DLC is a great thing. Yes, the demo is great. But you can also wait a week for it. The demo probably won't hold your interest between September 19 and October 3, so it's even less likely it'll completely captivate your interest from September 12 to October 3. That said, this is not a criticism of those who are trying to buy the demo off people. It's your money. Do what you want with it. The point of this article is that Nintendo wanted this sort of home-grown industry to happen. It's completely illogical that this industry exists, yet it's so easy to predict that it would happen. What do outsiders think when they see that an industry sprouted over demo codes that are literally worthless one week (at most) after they exist? They might wonder the root cause of this sensation. The root cause? Super Smash Bros. For 3DS must be an amazing game to elicit such illogical hype. If these crazy people are going through all this just to play a demo a week early, then I should be interested in the game, too! “If the codes weren't given out early, you would all be able to live with the September 19 date. In conclusion: Nintendo of America made a "normal" release date for the demo. Then they made an "exclusive" release date. They could've easily released it at the same time for everyone... BUT. Someone in Nintendo's marketing department thought that this tiered approach would build more sensation for the game. They were right. Well done! Now do the same, if not better, marketing idea for the Wii U version. You know, the version that needs it. One last remark: This should make up for the widely-panned set of Gold/Platinum rewards for Club Nintendo year 2014. Ludwig is enjoying his demo copy, which was generously donated to him. For free. As in, he didn't pay for it. He wouldn't pay for it anyway. Would you? Share your thoughts in the comments! Supply and demand return with amiibo pricing. I haven't made Platinum in yeaaarrrss! People are saying there IS a difference between this demo and the one coming out on Friday--the one being released to everyone on Friday will be limited to 30 plays. Which means you can play it twice a day every day. That should last you long enough.